Want to learn to play Christmas Carols on the piano? Great! These Christmas song piano lessons are written with beginning piano students in mind. 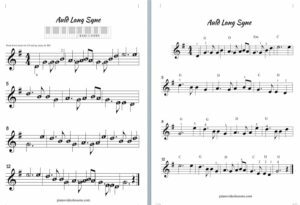 Each one has two versions: Easy Beginner Piano Version and Easy Chord Style Piano Version. 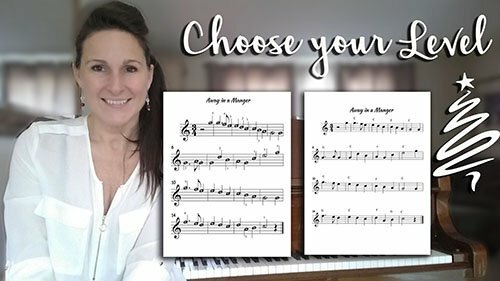 If you you are just getting started and know your piano key names and finger numbers, choose the Easy Piano Version. If you can read notes in the treble staff, give the Easy Chord Version a try! Need to fill in some gaps? No problem, get the free lessons you need here! Prerequisites for Easy Piano version lessons are Piano Key Names and Piano Hands- finger numbers. Prerequisite for Easy Chord version lessons is reading notes in the Treble Clef. Choose your lessons from the index below.